It’s an exciting time for enterprise software startups, as both Hortonworks and New Relic filed for their IPOs in the past 24 hours. For those following our coverage of tech IPOs know, we’ve been exploring the connection between the ratio of revenue to expenses (and more specifically what % of expenses are covered by revenues) and how it relates to the survival of the company as an independent entity over the long term. Historically, slipping below 50% of expenses covered by revenues has been a dangerous path. 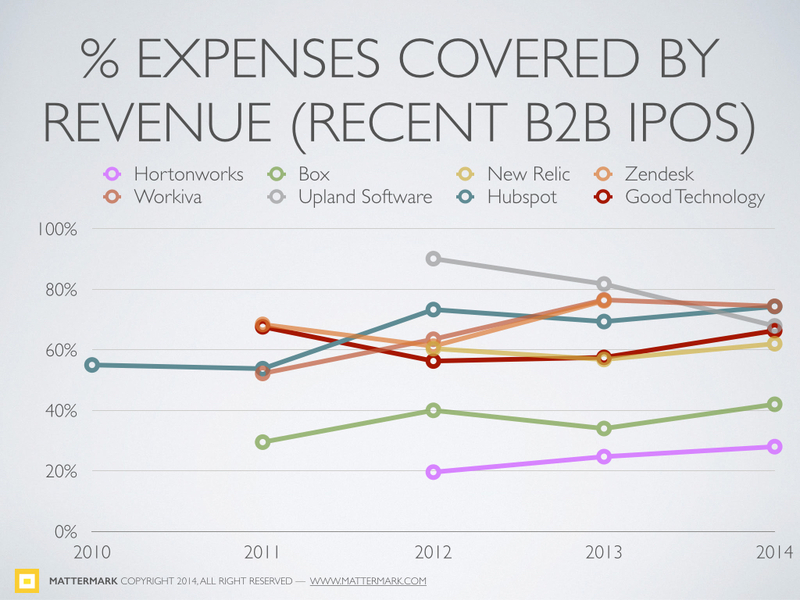 While Box was lambasted for high expenses and slower growth they still covered 48% of expenses with revenue, while Hortonworks covers just 28%. Also notable is that Hortonworks was spun out of Yahoo just 3 years ago, while the average tech company takes 7 years to IPO. One possibility is that the Hortonworks IPO is a reaction to heavy investment in competitor Cloudera, which has received more than $1 Billion in funding including a $900M investment from Intel Capital back in March.